In a world full of zombies, one thing is certain, people are going to die. This season on The Walking Dead when the curtain got pulled on one of the longest running characters, Rick Grimes, it shocked the show but also had the real life effect of haunting Norman Reedus while shooting the current running episodes. "I've seen so many people come and go," Reedus said on Friday at PaleyFest. "Right now on the show, the ghosts of all those guys are with me through every frickin' scene. 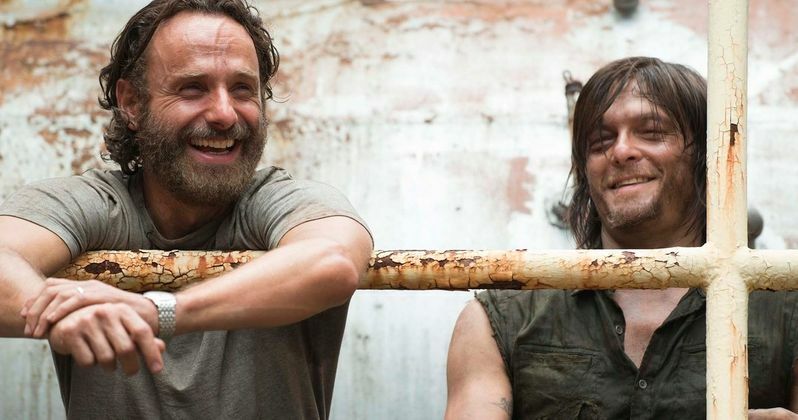 I remember how tight Andy [Lincoln] and I are, how tight Scott [Wilson] and I were and Jon [Bernthal], too." How could they not be tight after surviving 9 seasons of one hellish scenario after another with Andrew Lincoln being there from the beginning of the hit AMC series as the unforgettable Rick Grimes. Andrew departed the show halfway through season 9, so he could dedicate more time to family life at his home in England. With so many dangerous situations confronting them, we all expect some characters to get decimated as part of the mechanism that makes the show so enjoyable. Even in those daily dire circumstances we were a bit shocked over here that such a large character was leaving the fold. During the panel at PaleyFest, Norman Reedus revealed that he and Andrew had made a pact. The pact between the two was that if either one of them were to leave the show, then the other would leave too. Reedus also revealed that he was the first to learn of the exit that was being planned by Lincoln and the show. He then illuminated the audience on exactly how Andrew said his goodbye to everyone. "He left the show in such a poetic Andrew Lincoln way. He stood up and gave a speech to everyone. People pulled out their phones and he goes, 'Everybody put down your phones, this is ours.' That was such an Andy thing to do, such a right-on thing to do. I feel like he's with me there every day." The Walking Dead panel at PaleyFest consisted of both old and new cast members. Recently added actors Ryan Hurst, Eleanor Matsuura and Lauren Ridloff were onstage for one of their first panels with Christian Serratos. They were joined by Season 9 showrunner/writer Angela Kang. The whole talk was facilitated by comedian and Talking Dead host Chris Hardwick whose immense knowledge of the show helped guide the conversation in some interesting directions. Daryl Dixon onscreen is one of the most beloved and badass characters on The Walking Dead, however Reedus opened up onstage to explain his feelings of not being so secure early on in the show. Surprisingly, Norman said that he felt like an outsider amongst the cast in the first season. "I came on in the third episode and the cast already knew each other. They had done press and were all super tight in the beginning. I didn't quite know what I was going to do. I immediately got a chip on my shoulder." Who knows, that tension may have translated to some of the great moments we have been able to see on such a memorable show. The Calm Before airs tonight on AMC. This news comes from Variety.